James Salter (1925—2015) was one of the most gifted writers in American fiction. He was a fighter pilot in the Korean War, and his first novel, The Hunters, is based on this experience. His other novels include A Sport and a Pastime and Light Years. The author of the memoir Burning the Days, as well as screenplays, essays, and short stories, Salter received the PEN/Faulkner Award for his collection Dusk and Other Stories. Elected to the American Academy of Arts and Letters in 2000, Salter published Life Is Meals with his wife, Kay Eldredge, in 2006. 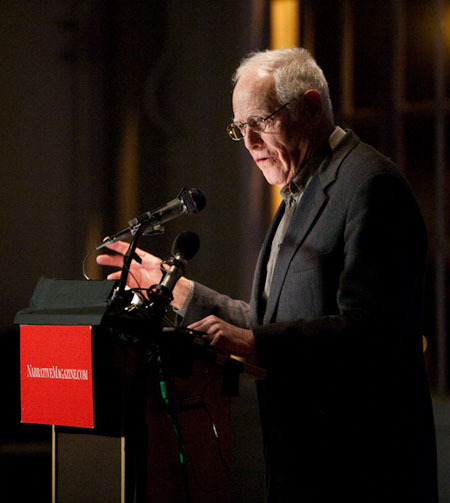 The debut of a new story from literary master James Salter capped off an evening of great readings and support at the Narrative Night 2010 in San Francisco. Salter held an audience of four hundred captive with a charismatic performance of his latest tale of attraction and desire.